The University of Connecticut subscribes to the Statement of Principles of Good Practice of the National Association for College Admission Counseling. It supports the efforts of secondary school officials and governing bodies to have their schools achieve regional accredited status to provide reliable assurance of the quality of the educational preparation of its applicants for admission. The University does not enter into any quid pro quo contracts, either explicit or implicit, with admitted students. Services expected shall not be a consideration in admission. Several schools and colleges of the University have additional special requirements. See individual school and college sections of this publication for further information. Please refer to the current application for admission for detailed information regarding requirements and application deadlines. See “Academic Regulations” section of this Catalog. 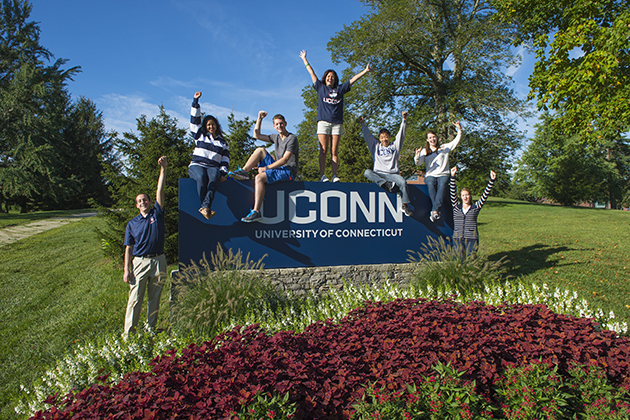 UConn Early College Experience (UConn ECE) provides academically motivated students with the opportunity to take UConn courses while in high school. These challenging courses allow students to preview college work, build confidence in their readiness for college, and earn college credits that provide both an academic and a financial head-start on a college degree. There are over 195 Connecticut high schools that offer UConn courses through this concurrent enrollment agreement with the University of Connecticut. UConn ECE instructors are high school teachers certified as adjunct professors by the University. UConn ECE courses are overseen by University faculty members from participating departments, in accordance with national accreditation standards established by the National Alliance of Concurrent Enrollment Partnerships (NAPEP). A transfer student is one who has enrolled at an accredited postsecondary institution following high school graduation and has completed a minimum of twelve credits. To evaluate applications for transfer admission, primary consideration is given to the applicant’s cumulative grade point average, quality of courses taken, and intended program of study at the University. Please refer to admissions.uconn.edu for detailed information. Priority admission to the Storrs Campus is given to students who have completed two years of college prior to enrolling at the University. Students with fewer than two years are evaluated on a combination of high school and college work; i.e., high school average and class rank, SAT or ACT scores, and college performance (to date). Students must also be in good standing and eligible to return to the last institution of higher learning which they attended. Prospective transfer students are advised that only a limited number of transfer students will be admitted to the majors of the Schools of Business, Education, Engineering, Nursing, and Pharmacy. Students interested in one of these fields should consider other majors as alternatives; even if admitted to an alternate program, however, students cannot be guaranteed subsequent admission to their first choice of major. Prospective transfer students are also advised that they must fulfill all graduation requirements of their major at the University. Questions about these requirements may be directed to the Dean of their School or College after admission. The University welcomes transfers from the Connecticut community colleges and offers programs that will facilitate transfer to designated majors within the University. Course credits are transferred when (1) the course has been taken at a regionally accredited, degree-granting institution; (2) the grade earned is no lower than a “C”; and (3) a similar course is offered by the University. College-level work given in or under the direction of an accredited college or university as part of the armed services program will be accepted for credit on the same basis as other transfer work. In addition, the University will consider for transfer courses completed at foreign universities and in study abroad programs sponsored by accredited American universities. The number of transfer credits students receive depends upon the character, quantity, and quality of the work they have completed. Grades do not transfer; the grade point average of transfer students is computed only on the work taken at the University of Connecticut. The student’s major department advisor and dean will determine whether transferred course work may be used to satisfy University of Connecticut degree requirements. Complete transcripts of all work taken at other institutions must be submitted as a part of the admission procedure whether or not credit for such work is desired or expected. Official transcripts for any course work completed after admission to this University must be submitted as soon as this work is concluded. Students who fail to acknowledge attendance at any college in which they have been registered automatically waive the right to have that work considered for transfer credit and may be subject to denial of admission, loss of course credit and/or suspension. Consideration for transfer of course work is made according to the Transfer Guidelines for Evaluation adopted by the University Senate. The H. Fred Simons African American Cultural Center, Asian American Cultural Center, Puerto Rican/Latin American Cultural Center, Rainbow Center, Women’s Center, Native American Cultural Programs, and International Student and Scholar Services are among the units that are available to all students interested in developing and promoting an understanding of various cultures at UConn. The University of Connecticut provides educational opportunities of the highest quality to all students. It makes a contribution to international education by encouraging the enrollment of students from all parts of the world. It selects, however, only those applicants who are academically and linguistically prepared for university work in this country. Prospective international students should begin application procedures one year before intended matriculation. Prospective students are encouraged to visit admissions.uconn.edu for application details and may email beahusky@uconn.edu with admissions-related questions. The University of Connecticut is committed to achieving equal educational opportunities and full participation for persons with disabilities. It is the University’s policy that no qualified person be excluded from participating in any University program or activity, be denied the benefits of any University program or activity, or otherwise be subjected to discrimination with regard to any University program or activity. This policy derives from the University’s commitment to non-discrimination for all persons in employment, access to facilities, student programs, activities, and services. For complete information regarding the University’s Policies and procedures regarding students with disabilities, please refer to the Center for Students with Disabilities. The University especially encourages applications from adults who wish earn a baccalaureate for personal enrichment, employment opportunity, and/or skill development. Adult students apply as freshmen or transfers and enroll on either a part-time or full-time basis at any of the five University campuses. Because the educational history, motivation, and present interests of adult students differ widely from those of the average applicant, the University may waive the SAT or ACT scores for admission purposes. Adults may enroll at the main campus in Storrs or at a regional campus located in Groton (Avery Point), Hartford, Stamford, or Waterbury. The regional campuses offer evening courses at all locations are within easy commuting distance, and provide a quality UConn education at a reasonable cost. The University of Connecticut participates in a regional cooperative program administered by the New England Board of Higher Education (NEBHE). This program, known as the New England Regional Student Program, permits qualified residents of the New England states to study with reduced tuition in certain programs at any of the state universities and the public two-year colleges and technical institutes. For a list of approved majors and information on the current Regional Student Program tuition rate, visit admissions.uconn.edu. Regional Student Program information is also available at www.nebhe.org. * Students enrolled in Agricultural Education, Diagnostic Genetic Sciences, Dietetics, Health Care Management, Real Estate and Urban Economics and School of Pharmacy will not be awarded the reduced tuition (or “Tuition Break”) until their junior or senior year. Freshman and sophomore years are not offered at reduced tuition. ** Students majoring in Human Rights are required to maintain an additional major offered in the College of Liberal Arts and Sciences or an additional degree program in another University School or College. Applicants to the Bachelor of General Studies (BGS) program must have earned an associate’s degree or completed 60 credits at a regionally accredited degree granting institution. In addition, applicants must have an individual interview with a BGS Counselor and complete the BGS application. All international applicants whose first language is not English or who do not have a transcript from an accredited university where English is the language of instruction must submit official scores from either the TOEFL or IELTS exam. A score of 213 on the computer based exam, a score of 79 on the internet based exam, a written test score of at least 550 on the Test of English as a Foreign Language or an overall band score of 6.5 on the IELTS (International English Language Test System) is required. International students who will study in F-1 status are also required to provide the International Student Financial Declaration Form and supporting funding documents. All new international students with F-1 status must attend a mandatory orientation session and physically check-in with International Student and Scholar Services (ISSS) at the beginning of their program. International students should regularly check the ISSS website for policy changes and updates. Non-degree study enables qualified individuals to register in credit bearing courses without being admitted to an undergraduate or graduate degree program. To enroll in undergraduate-level credit courses, non-degree students ordinarily must either have graduated from a state-approved secondary school or have a high school equivalency diploma. A bachelor’s degree is usually required for enrollment in graduate level courses as a non-degree student. Non-degree students must complete a non-degree application. If granted permission, non-degree students can register for credit courses for which they have the necessary background and qualifications and in which space is available. All prerequisites to a course (or their equivalent) as listed in the University of Connecticut Catalogs must be met by the student prior to registration. Special permission to enroll may also be required in selected courses or academic disciplines. Ordinarily, non-degree students may register for no more than two courses or eight credits in an academic semester. The refund policy applicable to non-degree students may vary from the refund policy in effect for degree-seeking students, and may also vary between the academic year, the summer, and special programs. Consult the appropriate course schedule for the refund policy applicable in a given term at a specific site. To continue studying at the University of Connecticut, a non-degree student must maintain a “C” average in courses taken at the University of Connecticut. If, after 12 attempted credits, a non-degree student has not maintained a “C” average or better (i.e., a cumulative grade point average of 2.0 or better), permission to continue as a non-degree student at the University ordinarily will be suspended. A higher grade point average is usually required for graduate level courses. Non-degree status does not constitute or guarantee admission to any degree program at the University of Connecticut. However, a non-degree student who has completed 24 credits at the University of Connecticut with a minimum grade point average of 2.7 is eligible to apply for transfer admission to an undergraduate degree program. An application and all required materials must be submitted to the undergraduate Transfer Admissions Office in accordance with their standard application procedures and deadlines. The Transfer Admissions Office handles the processing of all students, other than BGS students, moving into a degree classification. This includes students who have been enrolled at another institution prior to their non-degree study here, who wish to move from non-degree to degree classification, and are in the process of completing 24 non-degree credits; as well as non-degree students without previous college-level course work. Students are urged to check with the dean of the school or college they wish to enter to determine appropriate courses to take within the 24 credits. If admitted to regular status, a determination will be made at that time by the dean of the school or college in which the student has been accepted as to whether the credits earned as a non-degree student may be counted toward the degree. Credits from other institutions cannot be evaluated for transfer to a degree program at the University of Connecticut unless and until a person has been accepted into degree-seeking status. Regular application procedures for admission to graduate degree programs apply at all times. Ordinarily, only six credits earned in non-degree status can be used in a graduate program. Former undergraduate degree students at the University of Connecticut may enroll as non-degree students. However, if degree-seeking status is desired, former students should seek formal readmission to degree status at the University since credits earned in non-degree status might not be accepted towards the degree. For further information on non-degree study, see nondegree.uconn.edu. Individuals may attend undergraduate credit classes on a not-for-academic/audit basis as the instructor permits (Note: Individuals need to be 62 years of age or older prior to the start of the class(es) and permanent CT residents). An auditing senior may participate in the course only as the instructor permits. The instructor may unenroll individuals not meeting the auditing criteria set forth by the instructor. Laboratory, studio-type classes and online courses are not available for senior audit. Senior citizens auditing courses must adhere to the same code of conduct as all University of Connecticut students. All seniors planning to audit a course must first submit a non-degree application form. If given permission to participate in non-degree study, a senior citizen must present a completed senior form to the Office of the Registrar, Storrs Campus or Regional Campus registrar. Forms must be completed and returned with a nominal fee. Proof of identification is required at time of registration.